Yesterday I was back at PAFF-019 for one and a half hour of air time. 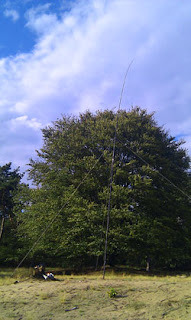 I brought my FT-817 (5W output), an end fed wire for 20m and my Spieth mast. Conditions were not very good, I think even a bit worse than last time. I did work 107 different stations from 24 different DXCC entities in 100 minutes, so I was not bored at all. The maximum distance was this time around 3500km in the direction of Ekatarinaburg in Asiatic Russia. Apart from a few stations from Asiatic Russia I logged only European stations. Most replies came from Russia, Ukraine, Poland, Italy and Germany. The weather was very pleasant with temperatures around 23 degrees and the view nice as always. The only downside was a strong and gusty wind. One gust of wind took down the antenna after 10 minutes of operation. Luckily everything was still in one piece, so I was back on the air in no time. Thanks to all OM's who took the time to work my small portable station.